Shivanga Sadhana for Ladies is a 21-day period of sadhana where women can experience the Grace of Linga Bhairavi. It will begin on Dec 31, 2018 and ends on Jan 21, 2019. Shivanga Sadhana for Ladies is a 21-day period of sadhana where women can experience the Grace of Linga Bhairavi. It will begin on Dec 31st, 2018 and ends on Jan 21st 2019. Read in Telugu: స్త్రీల శివాంగ సాధన – దేవి కృపను పొందే అద్భుత అవకాశం! A few devotees share their experience of the sadhana. 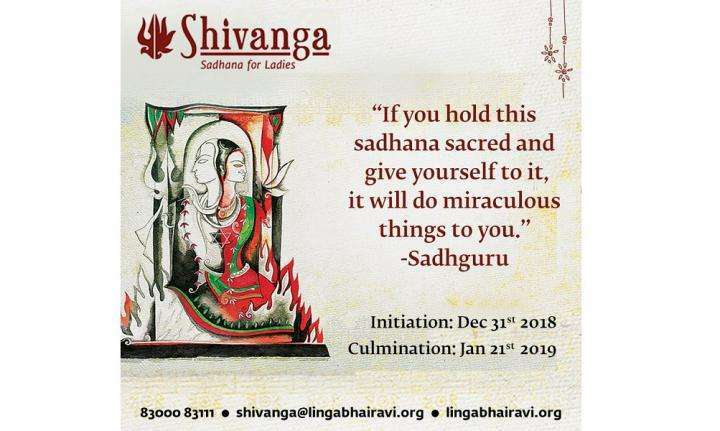 "Shivanga Sadhana for Ladies", you mean feminine or physically feminine? I am currently in the US and don't have any Isha Center in San Antonio. Can I do this Sadhana at my home? "For registrations, please contact your local Isha Yoga Centres. India: +91 83000 30666 or shivanga@lingabhairavi.org." Just repeated what's above. Do remember this fact too. "The sadhana period culminates at the abode of Linga Bhairavi in Coimbatore, on the auspicious day of Thaipusam, which also marks the anniversary of the Devi’s consecration." So, email and start off with the Sadhana. Jai Bhairavi Devi!!! High on Yoga@35000 Feet: Isha Upa Yoga on SpiceJet Flights! If you’re flying SpiceJet in the near future, chances are you could fit in a session of Isha’s Upa Yoga practices!